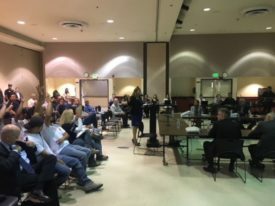 August 2, 2018 – Stanton, CA – The California Energy Commission held its Evidentiary Hearing in Stanton today, followed by a public comment session. The hearing was uneventful since W Power and the CEC Staff were in agreement on the Final Staff Assessment, which found that the Stanton Energy Reliability Center would not create any significant adverse impacts under the California Environmental Quality Act (CEQA). A public comment period was held at the end of the hearing where a number of elected officials, members of the building trades, and members of the general public expressed their support for the state-of-the-art energy reliability center. “We are delighted to have achieved this significant milestone on this exciting project. The support we have received from the City of Stanton and the greater North Orange County community has been amazing. We look forward to receiving our final approvals, closing financing, and getting construction underway early in 2019,” stated Kara Miles, the President of W Power.